Painting is an effective and cost-efficient way to significantly improve any property's health and appearance. At Premier Painting, our Danvers painting contractors are dedicated to providing the highest quality painting services possible to every client that we work with. Whether you need painting services for your home or for a commercial property, you can always depend on our professional house painters in Danvers, MA for excellent workmanship and professional customer service. All of our professionals are experienced painters who will always be able to handle any painting services that you need for your property. We understand that your home or commercial property is extremely important to you, so we strive at every job we perform to ensure that you're getting everything you need from the services that we provide. We'll make sure you're happy with our services from beginning to end, and all of our work comes with a satisfaction guarantee. Call us today to schedule your consultation with one of our Danvers painters, or to ask any questions you have about the services that we provide, and we'll be looking forward to working with you. Nothing is as important to the daily lives of you and your family as your home, so keeping every part of it in great shape is a major priority. 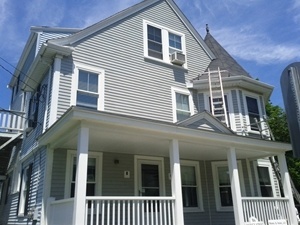 Our residential painting services are designed to help you keep your home healthy and attractive, and our contractors will work with you to select the products, colors, textures, and finishes that are perfect for your Danvers home. Painting your home's interior can improve you home's design and decor, and painting the exterior of your home can enhance its curb appeal. We'll always be able to guarantee the highest quality residential exterior and interior painting services in Danvers possible. Wallpaper can be a great part of a home's interior design. Our professional Danvers painting contractors can help you find the best wallpaper for your home's decoration style and provide you with a high quality installation. We have a wide variety of styles and designs available, and we'll be able to work with you to find the perfect match for your home. If you need to have any wallpaper in your home replaced, or if you'd like to remove it in order to paint a wall, we also offer wallpaper removal services. We'll be able to thoroughly remove any wallpaper without causing damage to your walls, and we'll leave every part of your home in great shape. "Bill: On a short notice you agreed to come into my father’s home on Hobart St. in Danvers. You did this painting of the entire two floors in remarkable time over the Holidays. As you pointed out before starting; that we would be 110% satisfied or you would not charge. It was a real pleasure having you do this work and I would highly recommend anybody that needs painting done to be sure to get in contact with you before starting with anybody else! Your painting has added new light and freshness to all rooms! Thanks again from me and my father!" "Bill Gilmore is seriously good. Intelligent, careful, honest. Technically excellent, but more than that, goes out of his way to point out problems and alternatives. He painted the tricky exterior of our historic house this summer with beautiful results. Very careful with plants and cleanup, reliable and responsive. If I could give him more than five stars, I would. You will love him in and around your home." "We own a single-family home as well as a multi-family house, and we have been customers of Bill’s for years now. He has painted rooms in our home and entire apartments, as well as porches and our shed, and we have been very happy with the results each time. Bill shows up on time and does a meticulous job. He has also helped us solve some tricky problems with the old horsehair walls in our multi family. Bill is very honest, his prices are fair, and he is very nice and easy to deal with. I would recommend Bill at Premier Painting to any of my friends or family without hesitation, and we will continue to use Premier every time we need something painted." If you are looking for a reliable Danvers painting contractor, please call Premier Painting at 978-532-7788 or complete our online request form.